In some ways tortoises represent an old conservation issue- as early as the 1800s, for example, people were concerned about overharvesting of giant tortoises on islands such as the Galapagos and Seychelles. Because they can be easy to approach (one study I read used the term ‘run’ with a special citation because none of these animals are speed demons) and some people find these animals fascinating, their conservation issues have gotten some attention [although probably not enough considering that I found the statement in one study that all existing species are in decline (Jacobson 1994)]. We found this tortoise walking down one of the trails at a study site in the Bolivian rain forest. As long-lived, slow-growing animals, tortoises are vulnerable to population declines because it can take them so long to recover. One study in Spain found that the average number of eggs laid by a female spur-thighed tortoise was 3.39 (Diaz-Paniagua et al. 2001)- when you consider how vulnerable young tortoises are, that’s not a lot. What this means is that tortoise populations really rely on adults to survive year after year so that they have enough chances to contribute to the next generation- it also means that tortoises aren’t great at recovering from a rapid population decrease. Why would tortoises opt for the slow route to population growth? Well, these animals tend to live in arid environments. Remember my surprise at finding tortoises in the Bolivian lowlands? It turns out that some tortoise species live in areas with more precipitation but with sandy soils that create locally dry conditions- the gopher tortoise of the southeastern US is a good example of this (Diemer 1986). Because tortoise survival is highly dependent on plant productivity, which in turn is dependent on rains that may not be consistent from year to year, it makes sense to produce a few eggs every year, that way your losses are minimized in a bad year (which would be hard to predict at the outset) and you have some progeny hatching during the good years. What are the main threats to tortoise populations around the world? A lot of the material I found concentrated on tortoises here in the US, and I think we could safely say that some of the issues facing tortoises vary from place to place and within time, but the main problems seem to boil down to habitat degradation and loss (it’s becoming my perennial refrain, right?). That habitat loss and degradation has taken different forms in different places. 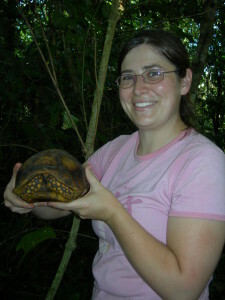 For example, in the Galapagos introduced goats competed with tortoises for forage and killed the larger plants that tortoises depended upon for cover (remember that tortoises draw heat from their environment, so they need a certain amount of exposure to sunshine, but too much is a bad thing) (Milinkovitch et al. 2004). In the southeast US, fire suppression has let closely-spaced trees create a closed canopy that reduces tortoise food at the ground level (Jones & Dorr 2004). Throughout the world, our development of arid lands both takes away tortoise habitat and creates barriers to tortoises that are trying to move between smaller habitat patches, whether in search of food or mates. According to Ruby et al. (1994), highways represent a significant source of adult desert tortoise mortality. To these habitat issues, we can also add hunting (or just shooting, as 14.3% of desert tortoise carcasses recovered by Berry (1986) in California between 1976 and 1982 had evidence of gun shots), collection for the pet trade, and the emergence of Upper Respiratory Tract Disease in multiple populations, which may have been partially spread by released pet tortoises (Jacobson 1994). Why should we care about tortoise populations? Well, aside from the fact that they are simply pretty neat animals, there are a number of ways in which tortoises contribute to the vibrate ecosystems around them. Since tortoises have to use exposure to sun and shade to regulate their body temperature, many species construct burrows for use during very hot or very cold periods. The areas they excavate for burrows tend to have a higher number of plants which sprouted from seeds and more herbaceous cover than surrounding areas because of the soil disturbance created by burrow construction (Kaczor & Hartnett 1990)- this makes for a more diverse habitat that can meet the needs of more species. These burrows also offer shelter to a number of animals [at least 19 species used gopher tortoise burrows in central Florida (Witz et al. 1991)]. Some tortoises eat a lot of fruit, making them important seed dispersers (Kaczor & Hartnett 1990). Tortoises play the long game– they live in dynamic landscapes that experience periods of drought and periods of plenty. Their strategy seems to be to wait out the bad times (Longshore et al. 2003), relying on high adult survival rates to keep the population going. Unfortunately, we have done a very good job of limiting the resources that are available to them at any one time through habitat change, as well as directly using tortoises for food and pets (plus target practice). Luckily, we have put a substantial amount of effort in trying to understand how to help these animals survive in the landscapes we now dominate- for my next post I’ll look at more recent research into tortoise conservation. Berry, KH. 1986. Incidence of gunshot deaths in desert tortoise populations in California. Wildlife Society Bulletin 14: 127-132. Diaz-Paniagua, C, Keller, C, and AC Andreu. 2001. Long-term demographic fluctuations of the spur-thighed tortoise Testudo graeca in SW Spain. Ecography 24: 707-721. Diemer, JE. 1986. The ecology and management of the gopher tortoise in the southeastern United States. Herpetologica 42: 125-133. Jacobson, ER. 1994. Causes of mortality and diseases in tortoises: a review. Journal of Zoo and Wildlife Medicine 25: 2-17. Jones, JC and B Dorr. 2004. Habitat associations of gopher tortoise burrows in industrial timberlands. Wildlife Society Bulletin 32: 456-464. Kaczor, SA and DC Hartnett. 1990. Gopher tortoise (Gopherus polyphemus) effects on soils and vegetation in a Florida sandhill community. American Midland Naturalist 123: 100-111. Longshore, KM, Jaeger, JR, and JM Sappington. 2003. Desert tortoise (Gopherus agassizii) survival at two eastern Mojave Desert sites: death by short-term drought? Journal of Herpetology 37: 169-177. Witz, BW, Wilson, DS, and MD Palmer. 1991. Distribution of Gopherus polyphemus and its vertebrate symbionts in three burrow categories. American Midland Naturalist 126: 152-158.